It is important to know that if a service of process is served incorrectly, it can jeopardize and nullify the case. At Writ Legal we make every effort to stay on top of the latest rules and procedures relating to the process serving industry. By its very nature, as the law changes, so does our practice. You can rest assured that Writ Legal pre-screens each process server and investigator to ensure that he/she is legally eligible to serve a process – particularly in states with licensing or by-appointment regulations. Take a few moments and browse the rules by state. 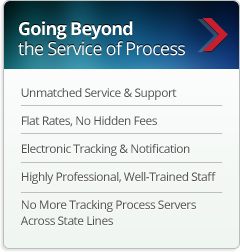 For more information on Writ Legal’s nationwide process servers feel free to contact our office at 1.888.667.2038. Please check back with us if you do not see your state listed below. We routinely update the rules for each state to provide you with the most up-to-date information. Kindly contact us should you notice an error in any of the rules listed in this section.